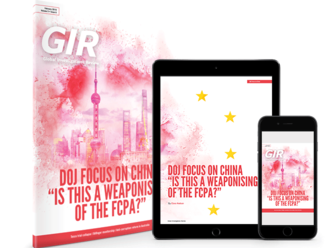 UK deferred prosecution agreements could put individuals' rights to a fair trial at risk, investigations lawyers said at GIR's third annual conference in London. 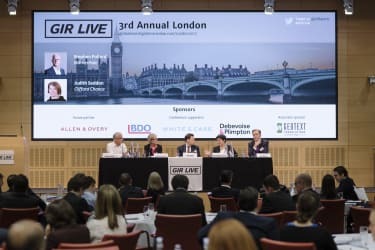 Speaking from the floor at GIR Live on 27 April, David Corker at Corker Binning said the UK's Serious Fraud Office may have made a "big mistake" bringing the Rolls-Royce and Tesco deferred prosecution agreements (DPA) as it could result in individuals claiming they can't access a fair trial. He said: "The SFO's desire to do settlements with the companies may have blinded the SFO to the effects on the trials of individuals." Earlier in the session Corker pointed out that pre-trial publicity arising from a corporate settlement can be a problem and could potentially prejudice the trial of an individual. He said: "It's a judge saying that he acted in a dishonest way, and nothing can be more prejudicial than that and therefore there should be no trial." Corker delivered his comments during a panel discussion featuring a host of people who've worked on some recent high-profile corporate settlements. Alun Milford, general counsel at the SFO, spoke alongside Clare Montgomery QC, at Matrix Chambers, who advised Tesco in its DPA in April. They were joined by Susanna Cogman, at Herbert Smith Freehills, who previously acted as counsel to XYZ in the SFO's second DPA, approved in July 2016. Paul Laffan, at financial advisory firm State Street, completed the line up. Cogman said that the different outcomes in the four UK deferred prosecution agreements signed off were "interesting" but pointed out that the Rolls-Royce DPA stood apart from the others. Comparing the engineering company's £497 million DPA to the Serious Fraud Office's (SFO) other agreements with Standard Bank, Tesco and XYZ, she said: "Rolls-Royce is perhaps the outlier because it couples a fulsome statement of facts with publication in advance of individual prosecutions." She added that despite the anonymisation of individual actors by the SFO in its statement of facts, it was difficult to see how the detailed facts outlined would not risk prejudicing the position of individual defendants in subsequent trials. Cogman spoke in response to a question from panel moderator Stephen Pollard, at WilmerHale, on maintaining the balance between an effective and open DPA process and protecting the interests of individuals who could be prosecuted in future. Montgomery said that individuals involved in the DPAs of listed companies would inevitably face problems because those companies have reporting obligations which would be triggered following preliminary judicial approval of a DPA in a private hearing. Individuals should instead concentrate their efforts on delaying the public hearing or applying for reporting restrictions, she added. Corker added that there could be an abuse of process in the trials of individuals if prosecutors argue a different and conflicting set of facts than those presented in the company's DPA. "Lawyers acting for individuals should research exactly how the SFO presented facts to the high court to see if there's any inconsistency in how they're presenting it to the Crown Court," he said. Milford emphasised the role of the judiciary in protecting individuals' rights to a fair trial and said that judges were well aware of potential prejudice to individuals in related prosecutions. He said: "In the Standard Bank DPA, the first question the judge asked was whether individuals would be prosecuted. Where there are cases of prosecutions of individuals or prospective prosecutions he's very careful of how that's managed." Sir Brian Leveson, the president of the Queen's Bench Division, has presided over all four UK DPAs.